Autumn boasts an array of delightful colors, making it one of the most beloved seasons. It is a time for cider and pumpkin. It is a time to celebrate with family, and it is a time to enjoy the last bit of warmth before the winter. Perhaps, these are some of the reasons why people love decorating their homes to honor the season. One of the most creative and interesting ways to do this is with DIY rustic pumpkins, which give a home a very autumn-like feel. The following are 20 different projects you can take on that are easy to complete and pretty fun. 4×4 wood blocks are perhaps some of the easiest pieces of wood to use for crafts. You do not have to waste too much time cutting since all you have to do for some projects is sand and paint. These pumpkins are pretty easy to do, though you will need to find some branches to finish the job. 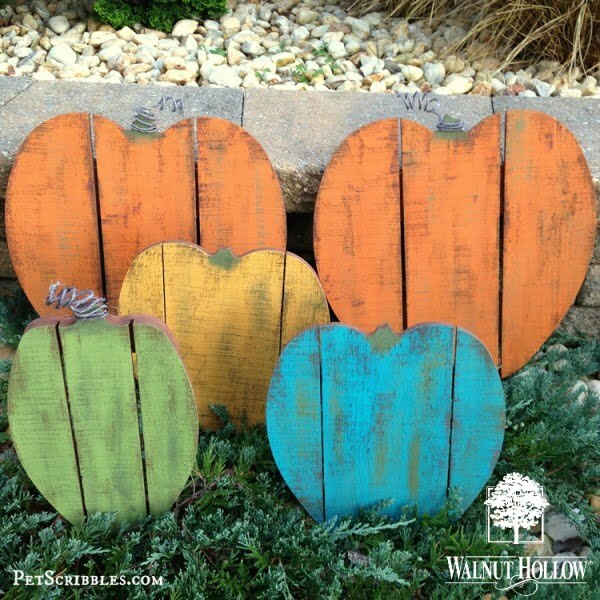 One circular saw and a number of pallet pieces is all you really need to make beautiful pumpkins for your home. The pieces are going to be relatively thick, so the pumpkins are going to end up being large decorations, which should make them durable. Be sure to have fun with the color because homemade pumpkins should have a touch of magic. You just need reclaimed 1/4 plywood pieces to get this job complete that shouldn’t take too long. You will need some rustic wood finish to make the finished pumpkin decorations look their best, but this should definitely wow your neighbors. Best of all, you get to reuse salvaged wood, and it can last for years. Sometimes a DIY-selfer wants to get a little more creative than usual. Every piece does not have to look handmade, especially when you can easily make something sleek and chic. All you need is a few pieces of food and some patience to make these pumpkins. The idea here is to pull apart an old pallet you have laying around, and use some of your trusted DIY tools like a jigsaw to create the perfect autumn-inspired decoration. You are going to need some twigs to finish the job, but it should not take too long, and it should look great in the living room. Pieces of old barn wood and some reclaimed wood pieces can make your autumn a beautiful one. What you are going to do is trace a pumpkin on your barn wood, and use a jigsaw to cut out the piece. The rest involves some painting and hammering. It may seem like there is nothing to do with an old pallet, which makes it seem like wasted wood, but do not fret because autumn is giving you a chance to re-use your pallet. The idea behind this decoration is for you to recycle and make a rustic-like pumpkin out of you pallet. You do not need too much time to get this done, and it will end up looking great. A DIY-selfer likes to put a little bit of him or herself into the holiday decorations. There is no better time to do that than now. Autumn means pumpkins, and you can make simple wood blocks into creative pumpkins this season. All you really need is a few pieces of scrap lumbar and a jigsaw to create a pretty cute pumpkin decoration. You are going to have to sand the wood so that you can apply your paint, but this should not take too long to get done. All those scrap wood pieces you might have thrown away will serve you well for this little project. You are going to need 2x4x7 blocks of wood and some scrap paper to make these interesting autumn-inspired decorations for your home or to gift to friends. Not many would deny the fact that rustic is trending at the moment, which explains the pairing between autumn and the rustic look in this project. The pumpkin project only uses wood scraps, so you are being as green as possible. All you need to start is three 2×6 wood scrap pieces. Making one piece board wood pumpkins is not that hard since all you need is some plywood and common DIY tools, such as a table saw. You are going to want to add a stand because this pumpkin is going to be a sizable one like any good pumpkin should be. Sometimes the best finishing touch for a decoration is a few inspirational or quirky words written on a beautiful backdrop. You can do this without spending much if you have a few thin scrap wood pieces around along with some paint. Go ahead and get crafty and creative without spending much. Halloween pumpkins do not have to be carved from real pumpkins, especially if you have a few blocks of scrap wood around. All you need is some sandpaper, paint, and an active imagination to make scrap wood blocks come to life this autumn. Scrap wood is everywhere, especially in the home of a DIY-enthusiast like you. This also means it hurts to see good wood go to waste, so why not get some tools and carve out pumpkins out of scrap wood? It’s a fun project, and you can get it done in no time. Autumn has very recognizable colors that you can use to decorate anything, including some of your scrap wood pieces. All you have to do is get a few of these pieces and some basic tools to make autumn-themed blocks to decorate your porch. Okay, everyone does not have pallets, but these are easy to get. All you need is a paint brush, saw, and some paint among other common tools to get this project off the ground. You do not have to worry about decorating your home with real pumpkins. You will need a few boards, paint, twine, hot glue, and some vinyl to complete this box-like pumpkin. This can cost under two dollars since most people have these supplies. So go nuts, and start making wooden boxes to gift to others. Use your creativity when decorating in the pumpkin theme as you can make them from just about anything. This tutorial shows us how to craft these cute wooden pumpkins from 2×4’s. It makes great rustic style for your fall vignettes. The idea that pumpkins don’t have to be real vegetables is one of our favorites. This way we break out of the box that using real pumpkins puts us and decorate our home a lot more creatively. Check out how to make them from wood slices.